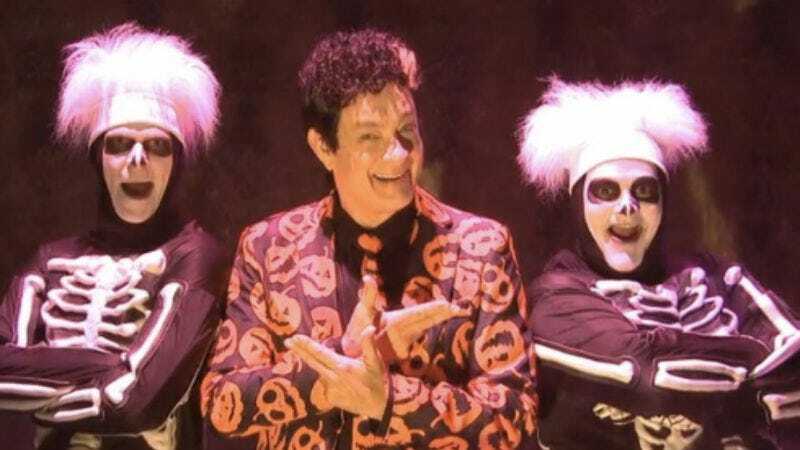 If nothing else, 2016 introduced one fiendish new character to the Halloween tradition: David S. Pumpkins. As portrayed by Tom Hanks on Saturday Night Live, Pumpkins is the main attraction in a house of horrors, and it’s not hard to see why. He wears a suit with pumpkins on it, is accompanied by two saucy, dancing skeletons, and has a golden streak in his curly mop of hair. Individually, those aren’t very terrifying things. But Pumpkins’ unaccountable and unavoidable presence at the haunted house is still the kind of thing to keep you up at night, even if, like Beck Bennett, you’re just wondering what the hell the “S” stands for—spooky? Smashing? Now at least one of those mysteries has been solved—in a Huffington Post interview, Bobby Moynihan details the creation of Pumpkins. Divine inspiration seems to have struck Moynihan and fellow SNL writer Mikey Day at five in the morning on a day before the October 22 episode. Apparently, they were working on some “weird dancing thing” when the name “David Pumpkins” came to Day unbidden. Moynihan ran the idea into the end zone by adding the middle initial. And with that, they struck confounding comedy gold, kind of like when you give your dog a first and last name. So what does the S stand for? “Simon”. That’s it. David Simon Pumpkins. Are Moynihan and Day big fans of The Wire or print journalism? Possibly, but that’s not the thinking behind the name. Moynihan says the character’s middle name is there “[f]or no reason whatsoever. It was a lot of the idea of just, ‘Why is this person here?’ Because he is. And we just thought that was funny.” Any (other) questions?